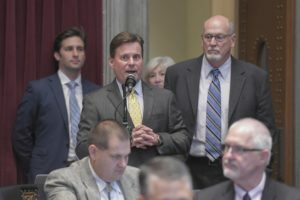 The Missouri House Ethics Committee met Wednesday in Jefferson City, to discuss a complaint that’s been filed. Most of the meeting was in closed session. It’s unclear what the complaint involves and who it is against. A Missourinet reporter was the only non-lawmaker in the hearing room when Committee Chairman Kevin Austin, R-Springfield, took a roll call vote. The committee then unanimously voted to close the hearing. The committee re-opened the hearing about 30 minutes later, and Chairman Austin announced that the committee voted 7-0 Wednesday to defer a complaint, pending administrative proceedings. Austin did not elaborate. A Missourinet reporter did not see any other lawmakers enter or exit the hearing room, while the committee met in closed session. It’s rare for the Missouri House Ethics Committee to meet. They met in early 2018 and in December 2017 after a controversial Facebook post from State Rep. Warren Love, R-Osceola. Love apologized for his words, saying he did not advocate violence toward the vandal.